Security Task Manager displays detailed information about all running processes (applications, DLLs, BHOs, and services). 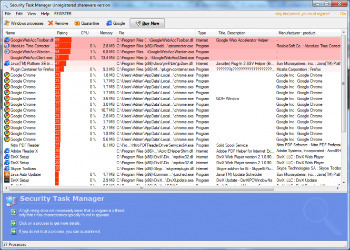 For each process, it improves on Windows Task Manager, providing a security risk rating, a process description, file path, CPU usage graph, start time, embedded hidden functions (for example keyboard monitoring, autostart entry, and browser supervision or manipulation), and process type, such as visible window, systray program, DLL, and IE plug-in. The security risk rating indicates the likelihood of the process being potential spyware, malware, a Trojan, or keylogger. It also deletes traces of your Internet and computer activity, prevents keyboard input monitoring, and warns you when the registry is changed. The security risk rating indicates the likelihood of a process being potential spyware, malware or a Trojan. The rating is purely based on behaviour and code analysis, and does not use any signature files.